Having radiant eyes and a spectacular mouth is one of the goal of many people and sometimes the facial expression is the one to blame for the premature wrinkles in this very sensitive part of the face. But to prevent wrinkles on lips and eyes is necessary to put something on our side and, in the more complicated cases, professional help. Eyes: This part of the face is very fine. Perhaps is the part we most gesturing with at the end of the day. 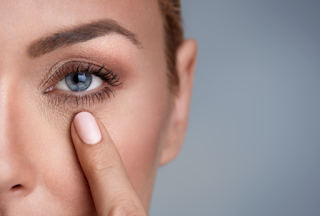 The best age to begin with eye contour creams is from 25/30 years. At that age the best are those that act as decongestants. From 35/40 years we need creams with revitalizing ingredients for delaying the progress of first wrinkles. After that is the moment to begin with creams anti tensor and anti wrinkles at the same time. Apply creams following these tips. Never scrub the eye. Apply them with small touches in the skin and if you see the upper lid is not firm, apply a small amount of cream there as well. If wrinkles are exaggerated perhaps the solution putting yourself in professional hands. Botox in these cases is the star. This substance relaxes the eye and prevents the eye contraction preventing the gesture of continuously wrinkle the eyes. The effects last between four and six months. Lips: Little wrinkles around the mouth are known as 'bar code'. Over years lips lose volume, the skin becomes thin and loses its elasticity and smoothness. There are specific creams for this side of the face, but can also be used eye contour creams. Its application is easy. Just apply it with circular movements with emphasis on the upper lip. The professional treatment star is the hyaluronic acid which lasts about six months. We can also choose chemical peeling or laser, but these are only recommended in more complicated cases. Relatively recently appeared on the market wrinkles correctors and fillers that work in a simple way. These creams have spheres that increase their volume once they are inside the wrinkle. They have an effect of filling the gap of the skin making it much smaller, creating a sense of erasing wrinkles.